The Smart Forfour Hatchback is about as compact as city cars come, and the hatchback’s design succeeds well in its aim of compromising as little functionality as possible. 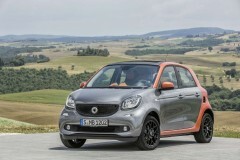 As a result, Smart’s four-seater is a car that can be driven in town every day. The forfour is an upgrade on the two-seater Smart Fortwo, but similarly offers a hard-to-beat turning circle of just 8.65m. Moreover, the fortwo is rear-engined and rear-wheel drive – not to be a sports car, but to improve cargo carrying space and manoeuvrability. The city car’s rear seats all fold, and you can lift the passenger seat, all with the aim of increasing space. Engines on the Forfour are the same as those of the Renault Twingo, which the forfour shares many components with, and overall ensures the smart car performs efficiently and economically in city environments. The compact car’s powerplant is a 1.0-litre three-cylinder petrol engine that comes in 71bhp, 90bhp configurations. Hippo Leasing can offer you unbeatable Smart Forfour Hatchback lease deals on the – to find out more, complete the form on the lease deals page for a member of the team to get in touch with you.